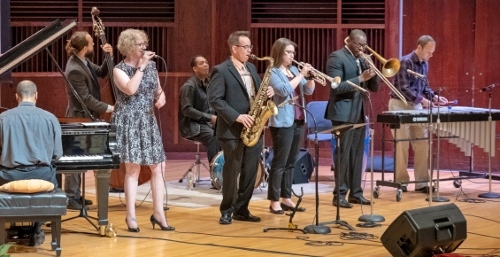 The UIndy Jazz Faculty Debut program on Sept. 24 quickly moved from entertaining to engrossing with audience engagement forward from Charlie Parker’s 1945 happy blues tune, "Billie’s Bounce," to a highly visual arrangement by Ernest Stuart of the standard "Bye, Bye Blackbird." On stage were: saxophonist/composer/bandleader Mark O’Connor, director of Jazz Studies at the University of Indianapolis, and five adjunct professors of Jazz, who are gigging and composing when not teaching: Jen Siukola, trumpet; Ernest Stuart, trombone; Steven Jones, piano; Brandon Meeks, bass; and Kenny Phelps, drums. The usual invite to “sit back, relax, enjoy the show” changed to "feel the beat, move in your seat" as the program gained traction into movement representing change—change of situation, emotion, place, landscape. With rhythmic variety at its core, the players established their virtuosity as soloists working in unison upon a fulcrum point of Soul Jazz, starting by faceting "Billie’s Bounce" across Afro-Latin rhythm into Soul and Funk. From that top I was seeing movement as the players traded off collective and individual spins of colors, textures, shapes, heft. Listening, I was choreographing on the bodies of Dance Kaleidoscope and Indianapolis Ballet dancers. It’s a habit, when one covers dance, to twin music with particular companies—especially with the works by Indy-based composers. Mark O’Connor’s melodically sensitive The Search, for me, represents a journey, seeking the intersection where jazz, blues, gospel and classic meet, merge, hang out, move on, double back, as a longing for unity. Pianist Steven Jones, essaying Billy Joel, with bassist Brandon Meeks and drummer Kenny Phelps, brought forward the meditative side of Jazz. On the other hand, Meeks, replicating his Miles Ahead film role as Miles Davis’ legendary bassist Ron Carter, put it all out there with mind-boggling phrasing for Donna Lee, inspiring the rest of the players to find the groove and extend it beyond the moment into memorable. Jen Sukola sets the opening moment of "Daisy’s Day" as a piano intro growing into the three horns in unison spinning the tune for solo entrances; first by her flugelhorn, leading the way for sax, bass, piano to grow into a sprightly tune alongside a steady-paced drum. It has the feel of in-the-moment against recall. I, for one, had a fine time conjuring up dual journeys into my imagined renditions of contemporary dance and ballet made amazing in the presence of live music—a funding luxury hardly possible in reality. Coming up Oct. 1, at 7:30 p.m., at the University of Indianapolis Ruth Lilly Performance Hall in the Christel DeHaan Fine Arts Center is the now-three-year-old UIndy-Based, The Indianapolis Quartet, featuring Zachary DePue and Joana Genova, violins; Michael Isaac Strauss, viola; Austin Huntington, cello; with guest artists Atar Arad, viola and Eric Kim, cello.